Click here to sign up to receive weekly Catch Me reports, detailing year-to-date tally totals for your location. The reports will be emailed to you every Monday. Recognition—It’s Your Department. We’ve prepared a variety of customizable materials to help you recognize ALL departments. You’ll find department-specific tip sheets loaded with recognition ideas, as well as certificates, thank you cards, water bottle labels, and candy / protein bar wrappers. All content is customizable, including language. Select a department to get started. 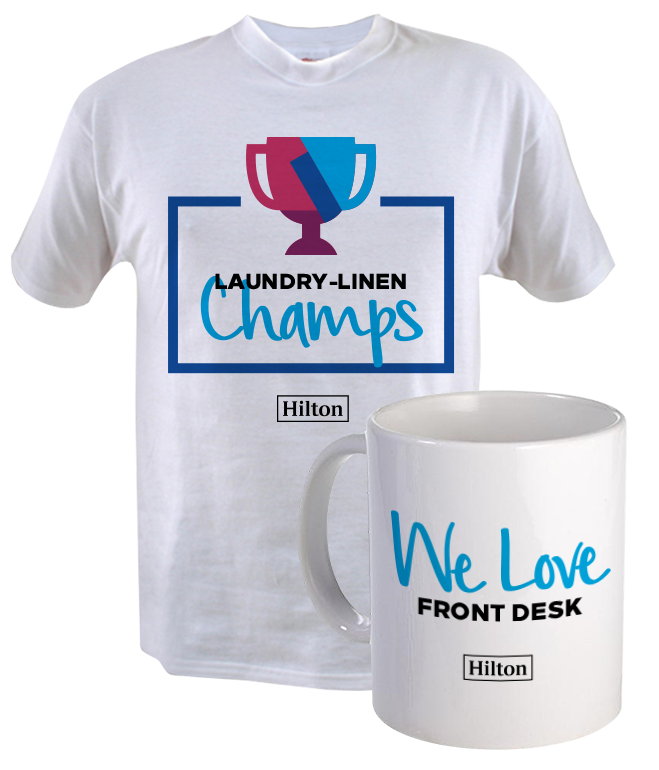 Choose from a variety of low-cost materials to recognize your departments of the month, such as T-shirts, coffee mugs, water bottles, tote bags, and more. Find out more. At Hilton, we’ve designated a specific month to recognize every department! Click here to view calendar. Download the same department specific artwork you see on this page. Use the print-ready artwork to create custom appreciation materials. Choose from a JPG or Adobe Illustrator vector file (EPS). and updating program information. Keep checking in for new materials.